Spray drained pasta with nonstick cooking spray. Set aside. Preheat oven to 175 F.
Place meatballs on lightly oiled, rimmed baking sheet. Working with 3 strands, twirl pasta around a skewer. 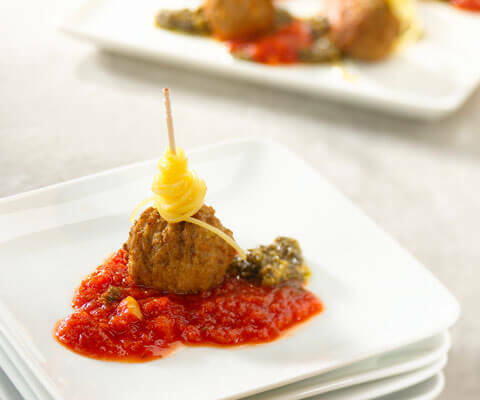 Stick each completed skewer into a meatball. Repeat until all meatballs are skewered. Spray completed spaghetti-and-meatball skewers with nonstick olive oil spray. Bake 5 to 7 minutes to “set” pasta. Meanwhile, choose a large platter for serving. Place pesto in a squeeze bottle with a large opening. Paint the platter, using a simple pattern of stripes or swirls. Using a teaspoon, make 64 puddles of Classico® Riserva Marinara sauce over pesto pattern. Place a warmed appetizer on each puddle of sauce.